The BowDagger in action: 100% counter weight stabilizer. Standing up for your bow. The idea for the BowDagger came on an elk hunting trip out west. Constantly on uneven terrain, I had a hard time finding a way to hold my bow up, secure an arrow on it in the upright position, and be ready to shoot. I had the idea of a riser-mounted dagger that would stick into the ground for stability, while also protecting the bottom cam. When you stand your bow up, you're constantly setting it on the ground, in the snow, on your foot, or leaning it up against another object, which over time, will cause wear or damage to the bow. The BowDagger has an integrated cam protector, keeping a 1/2" clearance between the bottom cam and the ground at all times. The BowDagger also acts as a counter-balance to offset the weight for all of the accessories you already have mounted to the opposite side of the bow's riser: sights, bow quivers, rest brackets, etc. The BowDagger is the only stabilizer on the market with a 100% counter-balance, off-setting this weight. What does the BowDagger do? 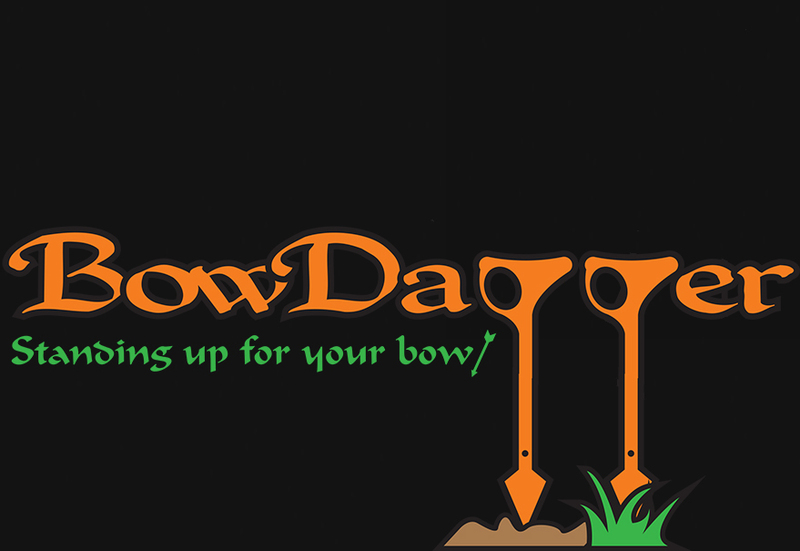 The BowDagger is a multi-functional stabilizer and bow holder. The BowDagger stands behind it's reputation "Standing Up For Your Bow!!"